High-Quality Materials - You'll have it for a long time! The Gaggia 14101 Classic Espresso Machine is one the best entry-level commercial quality espresso maker you can get for your home! 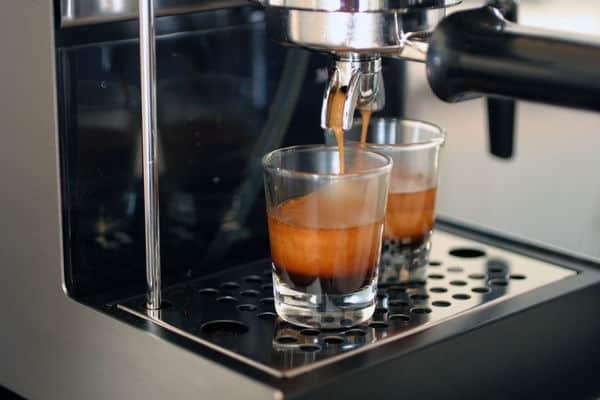 It produces tasty, flavorful espresso drinks but does not come with the enormous price tag of other semi-automatic espresso machines of this quality. This popular model has received praise from users on popular retail sites and from experts in top publications. Read on for my full Gaggia 14101 Classic Espresso Machine Review. The Gaggia 14101 Espresso Maker is built out of high-quality materials to stand the test of time. We cannot say anymore that Gaggia Classic it’s the best Italian-made espresso machine. It was made in Italy before Philips bought the company. To keep the retail price low and probably also make some more profit, the Gaggia Classic is now made in Romania. The housing is fashioned out of heavy-duty nickel-plated carbon steel that is finished with a layer of brushed stainless steel. The portafilter handle is also made out of stainless steel, making both it and the housing rust resistant. The portafilter itself is constructed out of chrome-plated brass and weighs a full pound. This makes it one of the most durable on the market for home espresso machines. 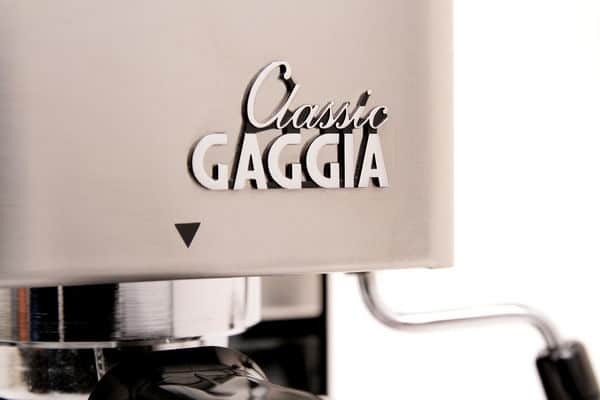 The Gaggia Classic is one of the few non-commercial espresso machines with a chrome-plated brass brew group (the part of the machine where the portafilter locks). This provides optimal heat regulation and temperature stability! This feature is only found in much higher priced espresso machines, like the Rancilio Silvia, which costs $200 to $300 more. 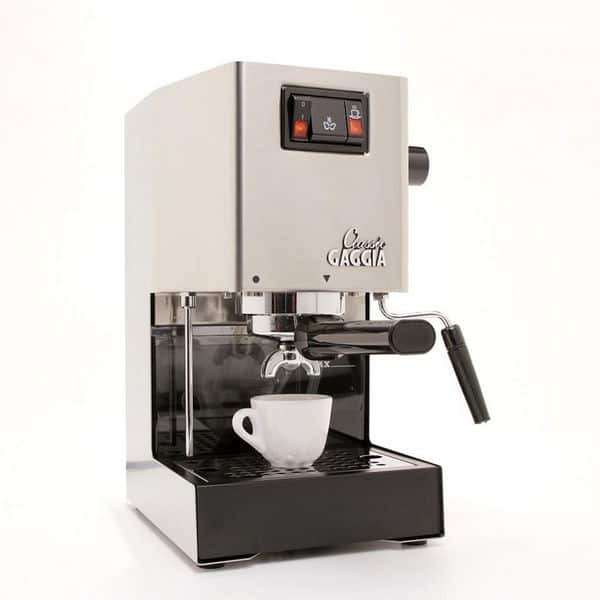 For all the benefits, there is a downside to this semi-automatic espresso machine that any Gaggia 14101 Classic Espresso Machine review should note. Its classic design with a commercial look may not fit into every kitchen. It is built on function rather than form in mind. You may not find the industrial look to be an attractive addition to the home decor, as the design isn’t colorful or as sleek as models made for home use. The large size and weight also make it hard to store the espresso maker out of sight when not in use. Still, some people do like the more minimalist design of this espresso machine and find it classically elegant. Your own taste will determine whether you like the look of the machine or its appearance is even a concern. The Gaggia 14101 Classic Espresso Machine is packed with many innovative features. This makes this model flexible, convenient and simple to use. Equipped with a 55-watt pump makes this espresso maker on of the strongest in its price range. The strength of the pump is important! The force of the water – as it flows through the pressurized filter basket – affects how much of the flavor and aroma is extracted. At higher pressures, espresso tastes richer and creates a beautiful layer of crema. Another great feature, or actually two features are the two integrated heater elements. They make sure the Gaggia Classic heats up very fast. You can brew your first shot after about five minutes! Other espresso machines take up to 30 minutes for initial heating! After your first shot, you only have to wait about 30-60 seconds before the Gaggia Classic is ready for another espresso! Gaggia Classic's inital heat-up time is about 5 minutes (up to 30 min. in other espresso machines)! Since it is not a fully automatic espresso machine with just one button, I recommend you to carefully read the manual. Especially if you have not had your hands on a semi-automatic espresso machine before. I wish the Gaggia Espresso Maker would come with a PID controller. This small electronic device balances temperature fluctuation in espresso machines, when installed. Well, I guess, somehow you got to sacrifice some premium features to get a better price. If you want to know more details, La Mazorcco wrote a great post about how PID controllers work. La Mazorcco is a professional espresso machine manufacturer, by the way. Anyway, how does this Gaggia Espresso Machine balances the temperature then? A thermostat does all the regulation in the Gaggia Espresso Machine. The boiler turns on when the water gets too cold and turns off again when it has reached a certain temperature. Why is a constant temperature important? In basic terms, when the temperature is too low the espresso can taste sour. Or, when it’s too high you may experience a bitter aftertaste. But, Gaggia is a professional manufacturer of espresso machines! So you can be sure, they did a great job to balance temperature fluctuations even without a PID controller. But, bear in mind, that temperature is not the only factor to consider when you experience a bad espresso shot! Stale coffee or a wrong grind size can also affect the taste! To further enhance the taste of coffee, the model features pre-infusion. The water first enters the pressurized filter basket with low pressure to begin releasing the flavor before the full-pressure brewing begins. This helps to unlock all the subtle notes of gourmet coffee beans. 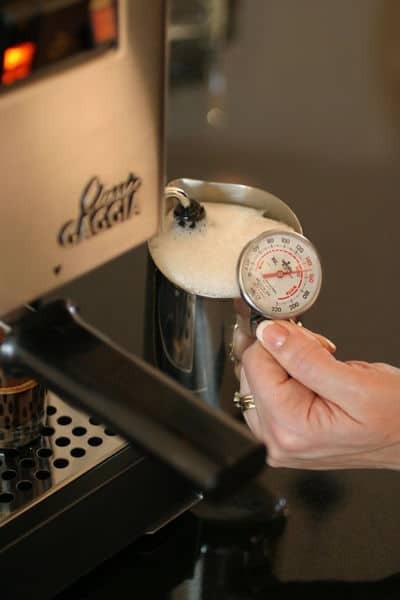 Portafilters typically measure around 50 mm in home espresso machines. Not the Gaggia Classic, which comes with a 58 mm diameter. This unusual large size in home espresso machines guarantees you a much better extraction. With the Gaggia 14101 Classic Espresso Machine, you don’t have to worry about having to wipe down your counters after brewing your espresso. The 3-way solenoid valve eliminates dripping and keeps things neat and tidy. Leftover water in the machine is relocated to the drip tray and not into the portafilter. 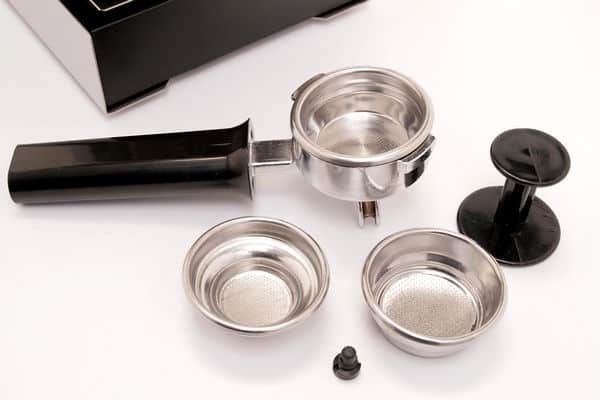 The result is a dry coffee puck that you can knock out of the portafilter without making a mess. The semi-automatic espresso maker also includes a cup warmer. It allows you to preheat your cups to keep your coffee drinks at the ideal temperature for as long as possible. Speaking of beans, the Gaggia 14101 Classic Espresso Maker gives you the flexibility to choose what you wish to brew. The espresso machine has a combination single shot/pod basket that you can fill with traditional ground coffee beans or with Easy Serving Espresso (ESE) pods. This way, you’re not limited only to pods or to grinding your own beans fresh. You can choose the best way to brew based on your schedule and your tastes. If there is one thing that could bother you on the Gaggia 14101 Classic Espresso Machine, it may be the low clearance between the portafilter and drip tray (see the image above). Unless you remove the drip tray, it only allows you to fit a small espresso cup or shot glasses underneath the brewer. This limits your ability to prepare a coffee drink in a traditional style large cappuccino or latte cup. Are you sometimes in a rush but don't want to leave the house without your daily espresso? Use an E.S.E. pod instead of grinding and tamping! All you can do is to pour your espresso from one small into another large mug. Why not just froth your milk in a large latte glass and pour the espresso shot in it? I know you normally do it the other way around, it’s just a suggestion. Want to try your hand at creating a cappuccino, a Café Latte, a Café Americano or another specialty espresso drink? The Gaggia 14101 Classic Espresso Machine makes it easy for you to steam milk or plain water like a pro. This model now comes with a Panarello Steam Wand instead of the previous Turbo Frother. With this wand, you can froth milk in seconds to the perfect consistency even if you haven’t developed a strong technique. The Panarello Wand is not just easier to use, it is also simple to clean! Although it’s not a unique feature, it’s still worth mentioning that you can also use the steam wand to make a perfect cup of hot tea or cocoa. One final drawback that this Gaggia 14101 review should cover is the fact that this model is only equipped with a single boiler. This means that you cannot steam milk and make espresso at the same time. While this slows down the process of crafting the perfect espresso drink at home, you can still make a latte, cappuccino or other coffee drink. You just can’t complete the steps simultaneously the way your local baristas commonly do. The Gaggia Classic is a fantastic espresso machine if you want to upgrade your home espresso equipment or start from scratch. Gaggia is a trusted name in the espresso maker scene and stands for high-quality. Their espresso machines are designed for a lifetime of daily use! And the price for what you get is hard to beat. Now it’s time for you to decide! Get your Gaggia 14101 Classic Semi-Automatic Espresso Machine now! Do you have the Gaggia Classic Espresso Maker? How’s your experience? Please share with me in the comments section below!